WaCKaDoO Michele ‘Bozo’ Bachmann is chosen for introducing legislation that wastes people’s time and wastes valuable taxpayer’s money. The Bachmann Brief: Rep. Michele Marie Bachmann (R-MN), the erstwhile presidential candidate, job creator, and self-avowed fiscal hawk, has won the title of WaCKaDoO of the week (wacko for short). She won the title for introducing 2 pieces of legislation on the first day of the new session of the 113th Congress, that exhibits a blatant disregard for the will of the people, is entirely self serving, and is a complete and utter waste of taxpayer money. Minnesota’s Republican “Swiss Miss” had a tough time being re-elected to Congress on November 6th, 2012. After facing her most formidable opponent to date, and she eked out a victory with 50.6% of the votes cast. Progressive business executive Jim Graves garnered 49.4% of the vote. Bachmann outspent Graves nearly 10 to 1 in one of the most expensive 2012 campaign contests for the House in the country. The tea-bagger and GOP darling is starting her seventh year on capitol hill, and yet she still hasn’t figured out how to introduce legislation that’s passed into law. To be fair, she did have a House Resolution pass by a voice vote once, that designated September as water on the brain month. Beyond that she hasn’t been very successful legislatively. After Bachmann was sworn in for her fourth term, she announced on twitter (graphic on the left - the full size graphic is after the break below with fabulous replies to her insanity) that she was very busy drafting legislation for the 113th Congress to consider. She was so busy that she missed the first vote to reelect House Speaker John Boehner to his leadership position. On the first day of the new session, she introduced 5 bills in the House. Her bill H.R. 45 is the 34th attempt by a member of Congress to repeal “Obamacare” or the Affordable Care Act. She didn’t want H.R.45 to feel lonely, so she also introduced H.R. 46, to repeal the Dodd-Frank Wall Street Reform and Consumer Protection Act. Let’s face it, in spite of President Obama’s re-election, where the people spoke and made their feelings known about “Obamacare,” Bachmann doesn’t care what the people think. She needs to repeal the Patient Protection and Affordable Care Act and health care-related provisions in the Health Care and Education Reconciliation Act of 2010, to keep the Koch Brothers and her other well-heeled campaign contributors happy. The Minnesota Congresswoman has no interest in protecting consumers. That’s why she wants to repeal the Dodd-Frank Wall Street Reform and Consumer Protection Act. It’s those actions, combined with her devil-may-care attitude about our nation’s finances that earned Rep. Michele Marie Bachmann the title WaCKaDoO of the Week (or wacko for short). Adam Peck of Talking Points Memo wrote about Bachmann’s efforts. The 112th Congress gaveled to a close on Thursday afternoon without passing a relief package for victims of Hurricane Sandy or reauthorizing the Violence Against Women Act, but Rep. Michele Bachmann (R-MN) isn’t too concerned about finishing what Republicans had left undone. Instead, at 12:00 PM she introduced the very first piece of legislation to repeal the Affordable Care Act, which states are now busily implementing. House Republicans have unsuccessfully voted 33 times in the last two years to eliminate health care reform and wasted at least 88 hours and $50 million, while failing to pass a single piece of job creation legislation in the last session of Congress. Dozens of Republicans, including 2012 presidential candidate Mitt Romney, ran against Obamacare, yet the party suffered losses every step along the way. The Supreme Court upheld the law, House repeal efforts went nowhere in the Democratically-controlled Senate, and President Obama has pledged to veto any effort to rescind the measure. Even newly re-elected Speaker John Boehner (R-OH) was compelled to admit in November that Obamacare is now the law of the land (though he later backed away from his own comments and pledged to do everything in his power to undermine it). But House Republicans are apparently not quite ready to give up the fight. At this rate, they could be on track to becoming even less productive than the least productive Congress in U.S. history. H.R.45 was referred to the Committee on Energy and the Commerce Committee, and the Committee on Education and the Workforce Committee, the Ways and Means Committee , the Judiciary Committee, the Natural Resources Committee , the Rules Committee, the House Administration Committee, the Appropriations Committee , and the Budget Committee. That’s eleven committees if anyone’s counting. And the Dodd-Frank repeal bill H.R.46 was referred to the Committee on Financial Services, and the Committee on Agriculture, Energy Committee and the Commerce Committee, the Judiciary Committee, the Budget Committee, Oversight and Government Reform Committee, the Ways and Means Committee, and the Small Business. That’s nine committees. The only committee that should be considering these measures are the wasting time and wasting taxpayer money committees. That’s what Bachmann’s doing - she’s wasting people’s time and taxpayer’s money - by introducing these bills that will go nowhere. Only a wacko would persist with this nonsense. 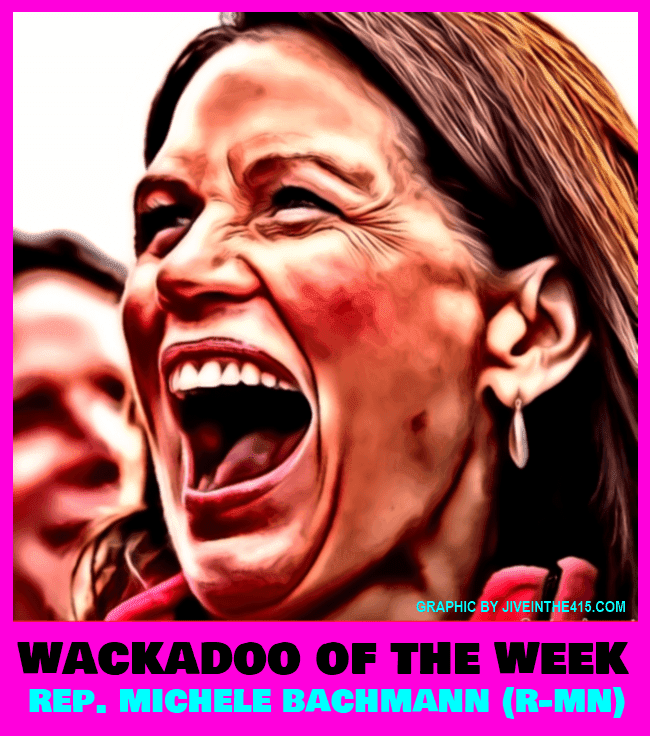 Michele Bachmann is our wacko of the week.